When time is of the essence, a fuss is the last thing you need. Each time the red light on your tester flashes to tell about a problem on the board, Quality Control are faced with a fundamental question: how do they know for sure that the board has indeed a defect. And equally important, how do they pinpoint it in the shortest possible time. That is the time when your quality engineer needs a solid and robust tool to help him locate the potential problem on the troublesome board. A piece of software he can rely on to put the circuit under scrutiny on his computer screen in a matter of seconds, and guide him through the most likely error locations in an intuitive and uncomplicated manner. A companion that will help him make a correct assessment of the situation on the board time after time. That is exactly what Ucamco’s FaultStation will do. Built for 32bit and 64bit Windows operating systems, it features DPF, IPC, MET, MWF and more... input to link to any data-prep system upstream. And with its multitude of different error file inputs, you are capable of doing defect review for your entire electrical test shopfloor from one single application, no matter how many different makes and models of test equipment you run. Sometimes data queries are just too hard to describe by E-mail, telephone or fax. On those occassions, your end-customer would give anything to be able to see what you see on your computer screen. FaultStation Client is an application you can freely distribute amongst your end-customers and which provides them with full data review and query possibilities. If you want, you can even let them review the tester error logs from their own batch of boards! All you have to do is extract an encrypted JBC file from your master station, lock it with the customer’s dedicated certificate and put it in an E-mail. Your end-customer’s client software recognizes the certificate and unlocks the data for reviewing. Recent-model Mania test equipment – flying probe or bed-of-nails – can output error data barcodes. Using the barcode reader, FaultStation automatically retrieves the required error data for the board under review. A real time-saver, particularly when a single batch of boards has been tested on different machines and the error data is scattered accordingly. Not to mention the added security of always reviewing a board with the right error data. 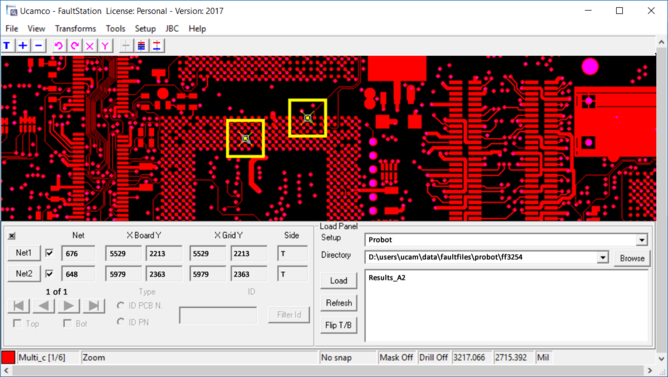 This feature becomes even more interesting in a so-called TFI (Test Floor Integration) environment: a bed-of-nails tester performs the initial test of a larger batch of PCBs. The reported errors are first relayed to a flying probe tester, which will either confirm or dismiss the initial calls. After filtering the false calls from the true ones, the flying probe tester issues barcodes only for the remaining real errors. They will be the only ones that will be retrieved and reviewed on FaultStation. The clever design of FaultStation’s new interface optimizes every gesture of the person at the controls. Feedback from users shows an increase in throughput of up to 10% on highly complex boards. Whether the operator wants to drive the program from keyboard shortcuts or from a mouse, he finds the functionality he looks for in the place he expects. The central Load Panel gives access to testers and error data. After confirming his selection, the user lets the program take control: the position and side information in the error files automatically scan, flip and rezoom the data on screen and put the operator right on the spot. Faulty nets are highlighted in different colors to make them stand out from all the rest. And the portions of the nets on other layers are displayed in cross-hatch mode. Locating a short on the board can be very fastidious. The task is hard enough already considering just the outer layers, and if inner layer review is required for Statistical Process Control (SPC), it can become a real nightmare. Nothing is simplier on FaultStation though, with the program’s auto-clearance scan feature. For every short it encouters, the software zips through the copper layers and graphically flags those where the two nets appear within a specified distance from each other. Obviously these are the locations to suspect first. A dedicated keyboard shortcut then puts you right on the spot, no matter how many layers the board contains. Operating a program has never been simplier, with an extremely short learning period as a result. Evidently, FaultStation also has a manual input of net, grid and board coordinates. This makes it compatible with virtually all earlier-model testers around and probably one of the most open defect review systems in the industry.